Over on the Archdruid Report a busy-sounding person asked John Michael Greer to just send him a list of predictions, presumably so the commentator could check them off as the years go by. I suppose you could do this, but it misses the point of describing a historical trend; the narrative is essentially poetic, and you can either grasp some deeper layers of the poetry or you can’t; furthermore the layers you see might be invisible to the author. I think such a list would be of no value at all for Greer, since most of his historical writing took place in the past five years and most of what he talks about has yet to come, but we can get some value from writing up a list of the predictions made by his predecessor, Oswald Spengler. We now have about a century of difference between Spengler and us and can judge the accuracy of many of his statements. So, I have attempted a 100th anniversary update to Spengler, maybe not quite in the same vein that caused people to write 20th and 30th anniversary updates to The Limits to Growth (“We’re still telling you so, and in 30 more years we’ll say we told you so”), but at least in the same great Western conceit that theories should make testable predictions. It became obvious while attempting this task that Spengler’s claims could not be written in checkbox form, and that if I quoted the entire supporting argument found in the text, this post would be book-length in short order. I have therefore paraphrased Spengler. Let us hope that it does not have to happen again. If you go to Amazon looking for the Chinese classics you will find a total mess. A bunch of publishers have ripped public domain books from Google Books and are selling them at various prices. Why should you avoid these? (1) The original editions of what you are buying were bilingual, but the cheap books might have removed the Chinese. If you are really going to read these texts seriously you need the accompanying Chinese. (2) Even worse, these editions might be bad OCRs replete with typos and missing pages. (3) You will want to hang on to these print editions for many years, and the cheap publishers will likely give you a version with an ugly cover, and no guarantees on the quality of binding glue. (4) Any markup you are charged on the printing costs is done out of utter greed and adds no value to the book at all. Here is the solution: buy print-on-demand versions from Google Books, thanks to the Espresso Book Machine. However, it is hard to find what you are looking for on Google Books’ search engine. So, I made this blog post. This might sound kind of strange but some of the authoritative translations of the Chinese classics were made in the 1850s. I know, who was even reading them back then? The fact of the matter remains that James Legge still towers above any classical Chinese translator who has lived since, with the exception of maybe Burton Watson. There is still no other full translation of the Rites, Odes, or Documents. Furthermore, Legge’s books include the full Chinese in beautiful woodblocks, something that will probably never happen again. Legge’s books can all be found on Google Books for free. The Espresso machine in the Harvard Book Store is the cheapest and shipping is also very cheap. I have included links for that order form as well, although you could just click the “Get this book in print” link available on the Google page. I also include a link to the Dover editions. These are rather good reprintings made in the 1970s that carefully mimeographed the original texts instead of swiping them under a digital camera. But they apparently did not find it profitable to reprint the more obscure books. I have linked as well to any superior modern translations that are available so you can compare their merits with the Legge. The exception is the Mencius, for which there are other translations out there but I did not find any of them comparable. * The Taoist texts were translated a little differently. They were in Max Müller’s Sacred Books of the East series and he apparently didn’t like including original texts. So, no Chinese, the Zhuangzi begins in the Tao Te Ching volume, and the translation is not the best. Might be better to consider alternatives. Legge translated the complete Confucian canon of the medieval era. However, Confucianism is more than just the canonical texts. Actually, Legge employed a scholar named Zhu Xi who was responsible for a major innovation in the way the texts were read. In order to really understand Confucianism it is necessary both to read texts that are outside the canon, and to read Zhu Xi and his detractors. Accessible translations of the unorthodox and medieval books are still in the works as we speak. Here is a list of what’s currently available for general audience readers. Surprisingly, the Hanshu 漢書 has never been translated in full. Bonus: 19th century translations of Chinese literature! It already contains the complete works of 王陽明, etc. Let me know if there’s something else I should add. edit: I downloaded Macaulay’s book and I am enjoying it quite a lot. I edited this post to provide more reading options for people. You may be familiar with Jun’ichirō Tanizaki’s essay In Praise of Shadows (1933). But were you aware that Tanizaki had a predecessor in the form of a Meiji period crank? I think not! Kaiseki Sata was a Shin Buddhist monk who published a ferocious series of essays in the 1870s, on topics such as “On the Uselessness of Bookkeeping and Ink”, “On Boycotting the Solar Calendar”, “On the Four Dangers of Western-Style Umbrellas”, “On the Great Dangers of Milk”, “On Railways: The Ruin of the Nation”, and everyone’s favorite, “A Caution Against Lamps: The Ruin of the Nation” (1880). I was unable to find any information about the majority of these essays, but the logic of “Lamps: The Ruin of the Nation” is actually not bad. Sata warns his readers that to light Western-style lamps you need kerosene, but Japan’s only oil fields are in Niigata, and would be depleted within 50 years (1930). If Japan becomes addicted to lamps and exhausts the Niigata fields, they will have to trade their reserve funds for oil until they have no more funds, and the nation will be ruined quod erat demonstratum. The argument is basically that oil is a non-renewable resource, and is therefore not backwards but remarkably foresighted. “The West became civilized in the Western way,” said Kata, “and Japan will become civilized the Japanese way.” He had no desire to plunge Japan into darkness. Instead, he invented himself a lamp that ran on vegetable oil, to which he gave the suitably native name kankōtō (pictured above; source). 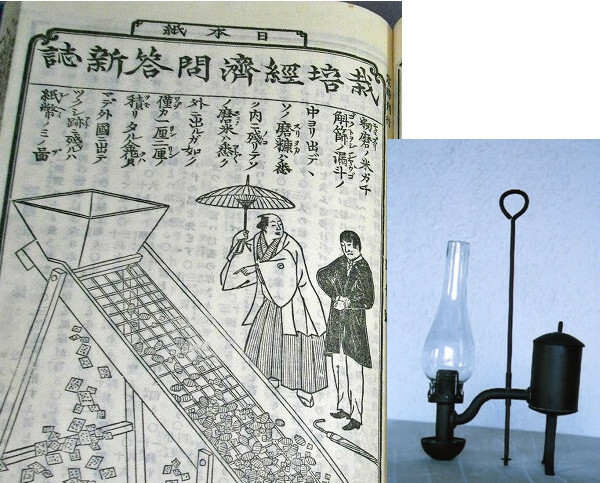 He also advocated for Japanese lamps, andon, which ran on fish oil. Sata only neglected to recognize that Japan could not defend its independence from the oil-powered Western nations without finding some oil of its own. Running steamships and tanks on vegetable oil would have been quite sustainable, but not politically viable. Indeed, the military use of oil was a principal motivation behind imperialism and World War II.